Welcome Miss Leah to the baby photographer blog! Oh my goodness, this little sweetie was so smiley! And happy! She is a carbon copy of her older brother, they really are the most adorable bunch! And her momma and daddy are equally nice. The amazing families that are my clients are really the best part of my job. It’s incredible to watch them grow! 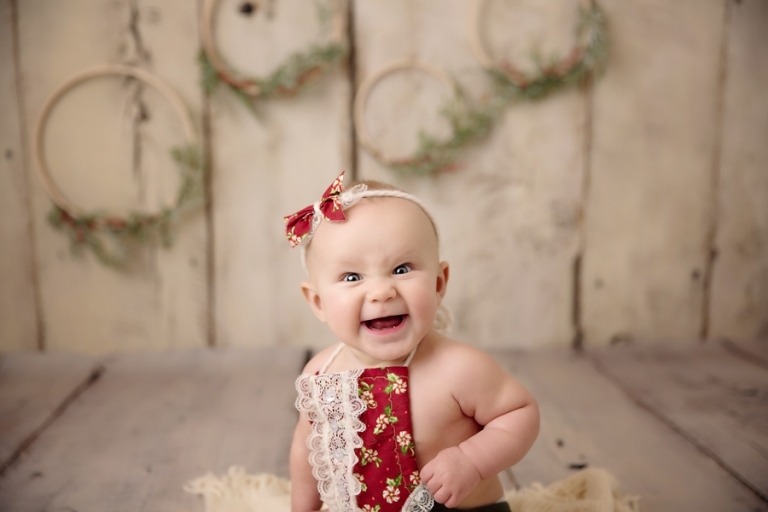 It looks like Miss Leah is ready for her first Christmas! I made these wreaths for the holiday sessions and love them for a simple holiday look. How sweet is her outfit from 3 Strands? I just love her and her sweet personality! 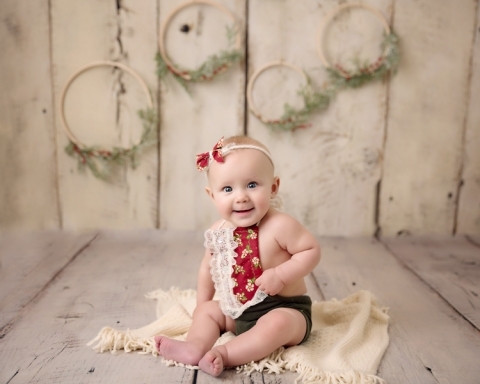 If you have read any of my previous posts, you know how obsessed I am with Baby Bliss Props floral crowns, well this sitter outfit by Baby Bliss Props is my new favorite. 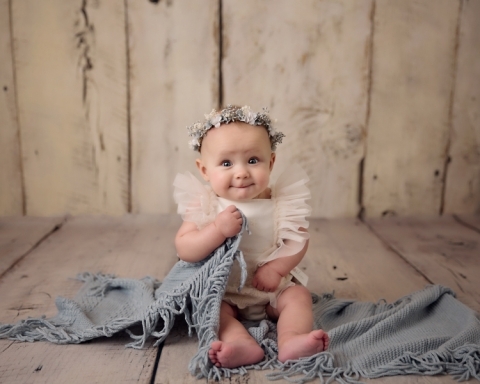 How can you not resist some ruffles on a sweet baby girl? 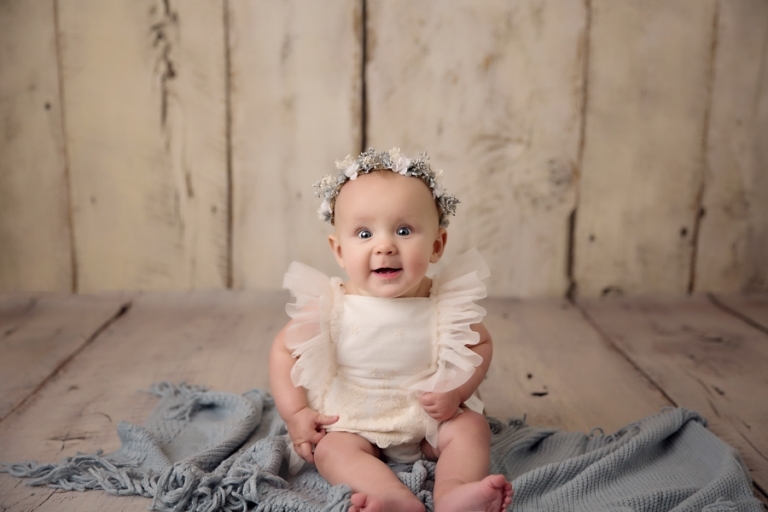 We used this floral crown in baby girl’s newborn session. One of my favorite things about sitter sessions is the personality that it captures. I mean, seriously, that sweet look trying to munch on the blanket. How adorable is that? Gosh, babies grow up and change to quickly! Oh the many faces of Leah! Her sweet expressions crack me up! I mean really, when I said Leah is smiley, I meant it. How adorable is her big gummy grin? I could just gobble her sweetness up! Gimme. All. The. Babies. Thank you so much for stopping by the blog! Please check out similar baby sessions on the blog and the portfolio. If you love simple and sweet baby photographers, please contact Mary today to schedule your session! Photography is something that you will love for years to come, you will never regret capturing these fleeting moments!